Not only can you move 2D and 3D objects in 3D space, but you can also move and animate your camera in this 3D space as well. This makes for impressive animatics and is also a great way to show off imported 3D objects. If the first frame does not do justice to your 3D camera movement in a printed or PDF version of your storyboard, you can add snapshots to better illustrate those wide sweeping, 3D camera movements. Be sure you are in the Camera view. You can also use the Top and Side views for further clarity if needed. In the Tool Properties view, click the Add Keyframe button. Even if the playhead is not at the start of the currently selected panel, a keyframe will be added to the first frame of that panel. NOTE: If the Timeline view is not displayed, select Windows > Timeline. In the Camera view, use the Camera tool and adjust the camera manipulators to change the camera‘s position and rotation. 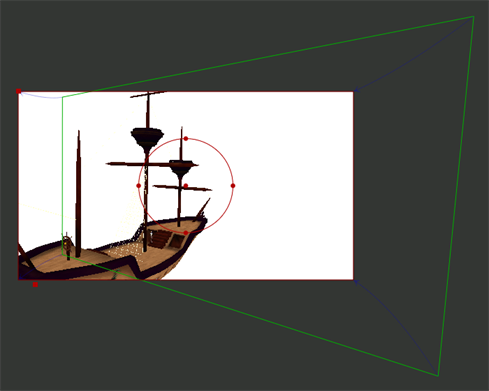 ‣ In the Timeline view, move the playhead to the frame on which where you want to place your final camera position. In the Tool Properties panel, click the Add Keyframe button to current frame. ‣ Click the Add Keyframe button at the end of current panel. A keyframe is added to the selected location. In the Camera view, with the Camera tool selected, use the camera manipulators to move the camera into its final position. If you do not see any manipulators in the Camera view, your second keyframe might not be selected in the Timeline view. NOTE: If the playhead is not at the correct keyframe, in the Tool Properties panel, click the Go to Selected Keyframe button to move your playhead there. Continue to adjust your camera move until you are satisfied. In the Timeline view, use the red playhead to scrub back and forth between keyframes to view the smooth, interpolated movement. Adjust the camera position on the first or last frame or add more keyframes between the first and last keyframes. From the Camera view Status Bar, use the Camera Mask to get a better sense of what the exact scene framing will look like.